Let us introduce you to the world of premium VPS services! ipxcore's premium VPS hosting is the logical choice if you need more power than shared hosting can offer, but don't want to have the large initial outlay of capital for your own dedicated server. With allocated and guaranteed resources, multi-core servers with high performance drives & memory, unthrottled network interface ports, and so much more, ipxcore offers quality VPS service that is truly premium. Each VPS performs and executes exactly like a stand-alone server for its users and applications, as it can be rebooted independently and has its own root access, users, IP addresses, memory, processes, files, applications, system libraries, and configuration files. Our premium VPS hosting solutions provide powerful environments for individuals and businesses of any size. ipxcore's premium VPS services are a perfect solution for online retail e-commerce business websites, corporate websites, community forums witnessing rapid growth, high internet traffic, or hosting complex software applications. Ready to begin your own hosting company? 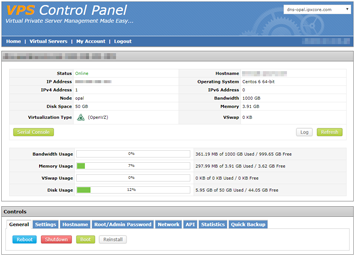 Coupled with a cPanel license, ipxcore's premium VPS services are the perfect starting point. Choose from over 100 Linux OS templates, including the full compliment of Turnkey Linux appliance templates. You can count on IPXcore's servers and networks. With average uptimes of 100+ days on enterprise-grade hardware, we'll be there for you. We allocate fewer customers to each of our premium VPS nodes, ensuring lowest contention and optimal performance for you and your audience. Starting your own hosting business, or just more comfortable with cPanel? Get a cPanel license for $15/month and get started today. Are you unsure which plan is right for you? Just ask if you have any questions! Every site is backed up weekly and retained throughout the life of the account. We can restore from any week anytime you want.